A rarely seen photograph of Tina Leser, made in 1950. She appears to be wearing a dress of her own design ( Notice the similarity to the plaid in the Kaiser and Frazer ad below). 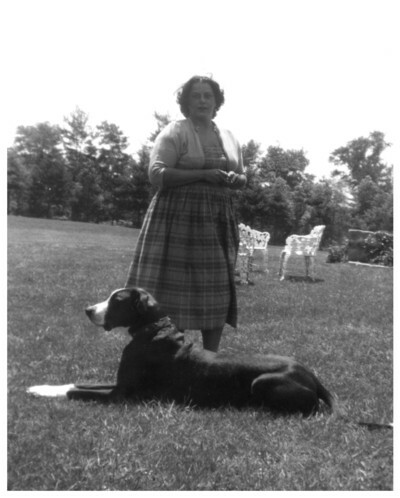 The photo was taken at her farm on Long Island, and she is seen here with her Great Dane, Taxi. Photo copyright and courtesy of Andrejs Sinats. 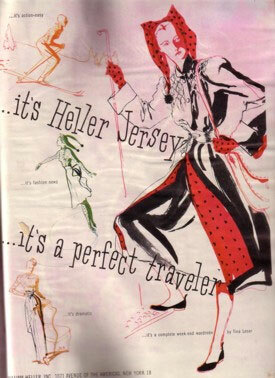 In 1940, Tina Leser went to New York on a buying trip and to try and sell her designs. Partly through the influence of Harper's Bazaar editor, Carmel Snow, she placed an order with Saks for 500 garments. She continued to live and work in Honolulu, but in 1941, decided to open a business in New York. She closed her Honolulu store in 1942 after the bombing of Pearl Harbor, and moved to New York. There she ran her company until the next year, when she became the designer at Edwin H. Foreman. It was at Foreman, that Tina Leser developed the international style for which she became famous. Tina was born Christina Wetherill Shillard-Smith, in 1910. She was the daughter of an affulent Philadelphia stockbroker and his artist wife. The family traveled widely, and as a young child, Tina visited Asia, Europe and Africa, and for a time, actually lived in India. When it came time to choose a career, she settled on art school, and attended first the Pennsylvania Academy of Fine Arts, and then the Sorbonne, in Paris. In 1931, at the age of 21, Tina married Curtin Leser, and the two of them moved to Honolulu, Hawaii. It was here that Tina Leser began her career in fashion. She opened a shop in 1935, in which she sold clothing that she designed. Leser used native Hawaiian, and imported filipino fabrics to construct sportswear, day wear and gowns. She then worked with a process to hand-block designs onto sailcloth. As an artist, she often handpainted a fabric to order. A customer might order a special skirt with the family pet handpainted on it. It was wartime, and travel around the world was quite limited for the private citizen. But Leser looked for, and found interesting cultural influences close to home - Mexico, Guatemala, Hawaii, and the USA countryside. From Mexico she took the traditional appliqued flannel jackets and added sequins. From Guatemala she took their handwoven cloth and made skirts and playsuits. Their blanket fabric was turned into strapless dresses. She utilized Hawaiian shapes - the sarong and the wrap skirt, and also used Hawaiian fabrics to make an innovative bathing suit that had just one strap. And she referenced the United States by taking the coveralls adopted by so many American women factory workers, and making attractive versions in flannel and plaid. ...it's a complete week-end wardrobe by Tina Leser"
The Honeymoon collection was featured in the November, 1949 issue of Holiday magazine. One of most remarkable events in Tina Leser's career was her honeymoon! She was remarried in 1948 to James Howley (she and Leser had divorced in 1935), and for their honeymoon the pair took a trip around the world. 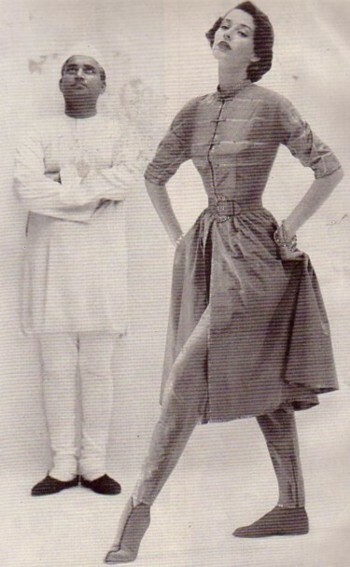 Actually, it was an inspiration-finding expedition, and it led to her Fall 1949 multi-cultural collection. The influences were gathered from what she would see on every step of her journey - kimonos from Japan, silk pajamas from China, a priest's coat from Thailand, the colors and embroideries of Indian fabrics, peasant clothing from Italy, antique fashion plates from France and porcelains from England - all influenced her fall line. In the photograph to the left, you can see how traditional Indian punjab pants were interpreted by Ms. Leser. She continued to reinvent this basic ensemble throughout her career. After 1949, Leser continued to reference a variety of ethnic influences, often mixing them in a single garment or collection. 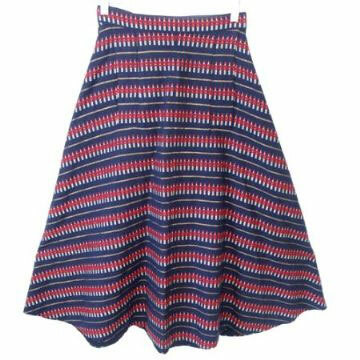 For example, she might take a purely American fabric such as the red and white check commonly used in picnic tablecloths, and sew it into an item with an Oriental-influenced shape such as a sarong or kimono. Leser also liked to take a "casual" fabric and use it for a "formal" function. An example would be the same gingham tablecloth cotton sewn into a party dress. Or she might take a formal fabric and use it for a casual function, as in the case of her elaborately printed and embroidered bathing suits. 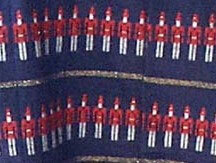 She also liked to take a favorite fabric or trim and use it across her collection. 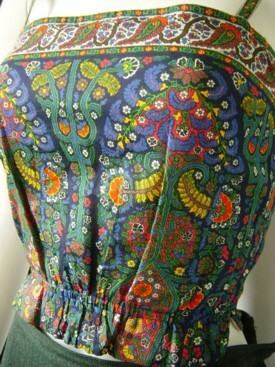 I've seen embroidery very similar to what is on this bathing suit made into a hostess gown, trimming the edges of a cashmere sweater, and made into a pair of slacks. But so that you don't start thinking that ALL Tina Leser could design was exotic and foreign-inspired, she also used fabrics from some of the very best fabric design firms. 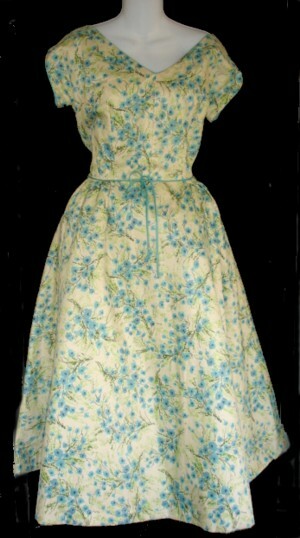 Most notably, she had designs using the "Modern Master" series of fabric from Fuller. This was a series of fabrics commissioned by Fuller Fabrics by some of the world's most prominent artists, such as Picasso and Miro. She also used Wesley Simpson prints, Hope Skillman fabrics and Boussac florals. And she loved and used cashmere, both from the American firm Dalton, and the Scottish Pringle. She designed lots of pretty dresses that today, would be considered to be quite dressy, but in the late 1940s and into the 1950s, were much more casual than what most people were accustomed to wearing. 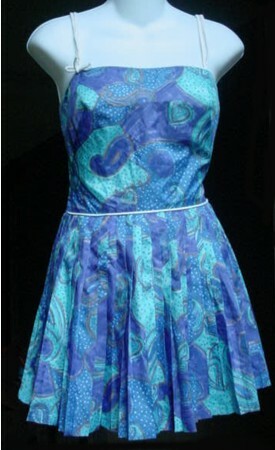 A great example is this wrap dress made from cotton sateen. It was featured in the May 1956 issue of Good Housekeeping, and earned their seal of approval! Tina Leser left Foreman in 1953 to form her own company, Tina Leser Originals. In the 1950s, women needed clothes for an increasingly casual lifestyle, and Leser's pieces were casual but sophisticated. People were entertaining at home, and many of Leser's ads during the 1950s show a relaxed hostess curled up in a pair of her slacks and a comfortable tunic. She perfected (some references say "invented") the slim toredor pants of the 1950s, which were often paired with exotic tunics or cashmere sweaters trimmed with embroidered edgings. And in 1957 she showed a cashmere sweater that was dress length, bringing about the inception of the "sweater dress." She entered into a design arrangement with Gabar Swimsuits, and she designed for them for many years. She's often thought of as a swimsuit designer, mainly because her work for Gabar was so wide-reaching. But it was not just the swimsuit she was designing - it was a whole new way of wearing it. The cover-ups and skirts and matching shorts and wraps incorporated the design of the swimsuit beneath into a complete ensemble. The bathing suit became the foundation for streetwear. In 1964, Leser closed her business, only to open it again in 1966. Her first collection after her re-opening was a tribute to India, with the fabrics being made on traditional Indian looms. She continued to make clothing that was oriental in feel, but she concentrated less on sportswear, and more on clothing was was adaptable to many situations, be it evening, day or at home. Her fabrics were still very much inspired by her travels. 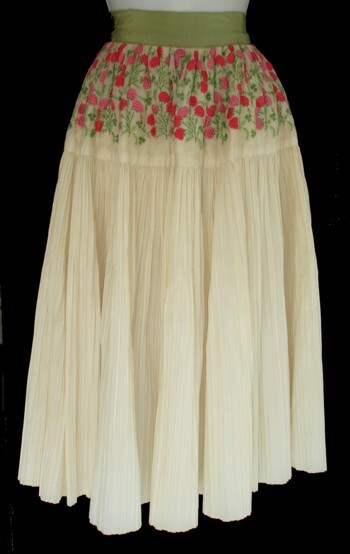 Full skirt with embroidered yoke. 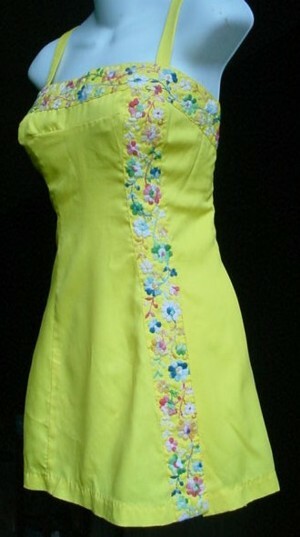 Leser did several lines with embroidered bright pink flowers. Tina Leser Originals remained open until 1982. Leser died four years later in 1986. Hers was a life of fashion and travel, and our fashion history is rich with the legacy of exotic places which she brought to us. Chambers, Bernice G., Fashion Fundamentals. New York: Prentice-Hall, Inc., 1947. Lambert, Eleanor, World of Fashion. New York: R.R.Bowker Company, 1976. McDowell, Colin, McDowell's Directory of Twentieth Century Fashion. Englewood Cliffs, NJ: Prentice Hall, Inc., 1985. Stegemeyer, Anne, Who's Who in Fashion. New York: Fairchild Publications, 1980, 1988. Copyright � 2005 - 2010 Lizzie Adams Bramlett. All Rights Reserved.